This year’s Round the Island Race is coming up on the 19th June, so this seems like a good time to draw attention to this amazing annual spectacle of getting on for 2000 boats all sailing in the same direction for most of a day – if you don’t count the spectators and sight-seers. Among that huge number there are bound to be quite a number of older and traditional craft, and the photos above are of two that took part last year. My thanks go to Peta Stuart-Hunt for her help in providing intheboatshed.net with its special needs! 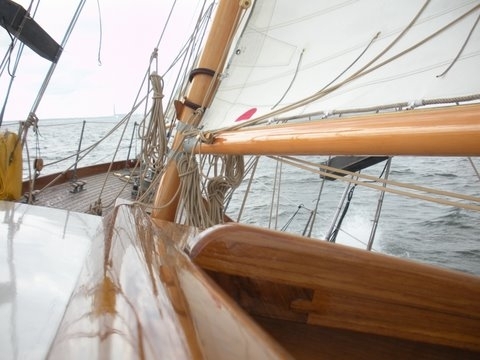 Maybird is a Fred Shepherd 43ft (52ft LOA) gaff-rigged ketch that will be competing in her first race since being restored at Saxon Wharf when she comes to the start line on 19th June. She was designed for Lt Col WCW Hawkes DSO, Indian Army (retired) and built by Jack Tyrell at Arklow, Co Wicklow in 1937. She’s had quite a history – in her time, she has been a gentleman’s auxillary yacht, an ocean passage maker and a Greenpeace protest vessel, and now she’s available for charter. Also a contender last year in the traditional gaffer class, Ocean Pearl was built in 1933 by Nobles of Fraserburgh and registered at Peterhead in Aberdeenshire. At 37ft 6in LWL, she was just under the 40ft length restrictions, which meant that she could fish within the three-mile limit of shore, and between 1933 and 1939 she was worked with nets and lines out of Peterhead. Between 1939 and 1945 she was requisitioned by the Navy and served as a supply vessel in Scapa Flow, before returning to the fishing industry after the end of the war. She then fished until 1967 before selling her to Joseph Anthony Moore Phillips, father of Captain Mark Phillips, the first husband of HRH Princess Anne, who based her at Whitby, North Yorkshire. In 1981, three owners later, she was taken to Staines in Middlesex to be restored, but was eventually abandoned in a disused tarmac works, where she lay for 15 years before being taken to Combes Boatyard in West Sussex. Nick Gates took over ownership in 1999 and over the past 10 years has rebuilt her, converting her from motor to sail. 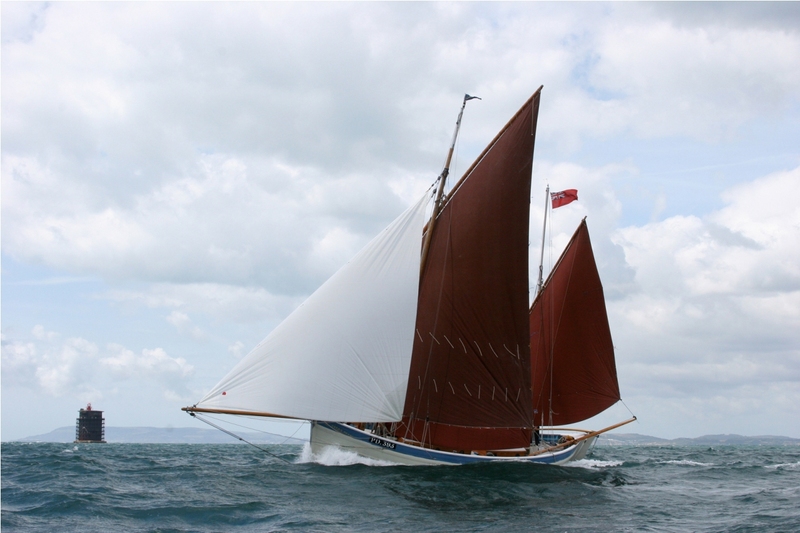 She is rigged as a Manx nobby, with standing lug main and mizzen, and sets 1600 sq ft of canvas. Ocean Pearl has been mentioned several times at intheboatshed.net – for earlier intheboatshed.net posts relating to her, click here.